Every now and then, a rare board game comes along that blends crunchy decisions and interesting combos with simple, clear mechanics that anyone can enjoy. Add incredible build quality, cute artwork and an unbeatable table presence into the mix and you’re certainly on to a winning formula. That, in an acorn-shell, is Everdell, and let me tell you —- it is every bit as good as the hype suggests. Keep reading and I’ll tell you why. Everdell is a game of worker placement, resource collection and tableau building in a woodland realm populated by one to four groups of animals. Each player controls one such group, which will be represented in game by gorgeous little wooden animeeples. Everdell is set in a forest beneath the Evertree, which is represented in the game by a large, well made and gloriously detailed model that is included in both the basic and Collector’s Edition versions of the game. The game takes place over three seasons, with each of the animal groups seeking to gather supplies and secure their position for the final scoring — which, thematically speaking, is winter. With each new season, one or two more workers are added to each animal group, but each player is free to decide when to move to the next season, which adds an additional layer of light decision making — do you attempt to progress first and grab actions early, or do you hang back and squeeze every drop of work out of the current season that you can? In addition to the worker placement spots that allow players to collect one of the games resources, everyone also has a hand of personal cards, as well as access to a shared hand of eight cards that are placed on the board, in a location called The Meadow. Many cards can be played without an action (although they may cost resources) so whilst the game appears as if it will be very brief thanks to the low number of workers in hand, it is actually much more involved that you might think. Once everyone has completed their actions for the final season (fall) the game ends. The winner is determined based on the sum total of points on all of the cards that players have in their personal tableau (up to a maximum of fifteen.) There are eight bonus objectives to score as well (four of which are randomised during setup) and some cards provide bonuses when combined, or bonuses for collecting certain resources or similar. Everdell is so, so beautiful, I’m not sure I have the vocabulary to do it justice. Even if they don’t like the game, I suspect some players might be tempted to keep it for sheer spectacle alone, as once the board is placed, and the Evertree set up, it just looks magnificent on the table. I should stress that I am reviewing the Collector’s Edition here, but the main difference is that this version includes gorgeous, shiny metal coins as well as some little wooden disks to show that a building is occupied, both of which are cardboard in the standard edition. there are three small expansions in the Collector’s Edition, which are the Legendary Expansion, the Extra! Extra! pack and the Rugwort solo expansion. These packs consist of twenty eight cards and some rat meeples for Rugwort’s crew. The board itself is fantastic quality with absolutely gorgeous artwork that clearly depicts all of the key locations, without ever losing the sense of style that links visual functionality perfectly with the whimsical woodland setting of the game. On the board, the player will position a three-dimensional model of the Evertree, which towers over the board and features a couple of tiers of branches on to which cards and animeeples will be placed. There are also a number of bonus cards (some of which are random) that will be added to either the branches of the tree, in clearings around the board or along the river that runs across its top third. A shedload of realistic looking and nicely crafted resources (rolly wooden logs, hard, shiny stones, translucent, golden amber and squishy pink berries) are also placed along the river at their gathering locations, with the effect of both the tactile resources and the huge Evertree put together resulting in a nice sense of height, albeit one that is, unfortunately, purely cosmetic. There are, of course, the animeeples, money tokens and a few other components, but the final major piece of the puzzle (and the one that you’ll spend the most time staring at) is probably Everdell’s single, huge pile of cards. Each player is dealt a hand of these (between five and eight) based on their starting position and a tableau of eight more will be placed onto the only bit of free space remaining on the board. There are over a hundred cards in the deck (including an advanced mini-expansion that i think you might as well use from the outset) and the artwork on each and every one is just adorable. About half the deck is made up of building cards, whilst the other half are the animals that occupy them. Most buildings are tremendously detailed, with creatures hiding behind stumps and scampering about in the background. The animal occupant cards provide close ups of the inhabitants of Everdell, with most being cute to a fault. Everdell is a relatively simple game that is very quick to teach, but with a pleasing amount of hidden depth that is slowly revealed to a new player over the course of the unfolding seasons. Beginning with just their hand of cards and a couple of animeeples in their chosen colour, players will take one action, which will generally be to place a worker or play a card. The trick here is realising that the eight cards on the board are freely available to the players, in addition to those in their hand. Many cards can be played for free (or with a very low cost) so the focus is actually less frequently on the basic function of placing workers than you might think. The opening move is often to place a worker in order to obtain resources, but as building cards are placed, they often produce resources immediately anyway. Because each building is paired with one or more creatures, it’s also often possible to place an animal card with its paired building for free, even if it’s taken from the shared cards on the board. What this results in is the initial impression that the game might be quite brief (because everyone only has two animals) but in fact, it’s more likely that the first season will last four or five rounds of turns, with the second more than doubling in length and the third and final season taking up around half of the play time. As each season begins, the players will take one or two new workers to add to their pool (depending on the season.) At the end of a couple of the seasons, all buildings that previously produced when they were built, will produce again, generating a vast amount of resources for the final round of play. As players collect resources, spend them on buildings, add animal cards and build out their personal tableau (up to a maximum of fifteen cards, unless a specific card breaks that rule) they will begin to notice more and more point scoring combos appear. Some cards care about other animals (like the Husband and Wife) whilst others care about resources in hand at the end of the game. Others give bonuses depending on how many buildings of a certain type you’ve constructed. These point scoring options drive player behaviour, because as you’ve probably guessed, the player who scores the most at the end of all seasons will be the winner. Playing Everdell is both relaxing and joyous and surprisingly taxing at the same time. You might be be drawn in by the gorgeous aesthetic and incredible table presence, but you’ll stick around for the simple, addictive mechanics. Over the course of only a few turns, the penny will drop and before you know it, you’ll be looking into maximising your point scoring engine and preparing to make the most of the next harvest phase. 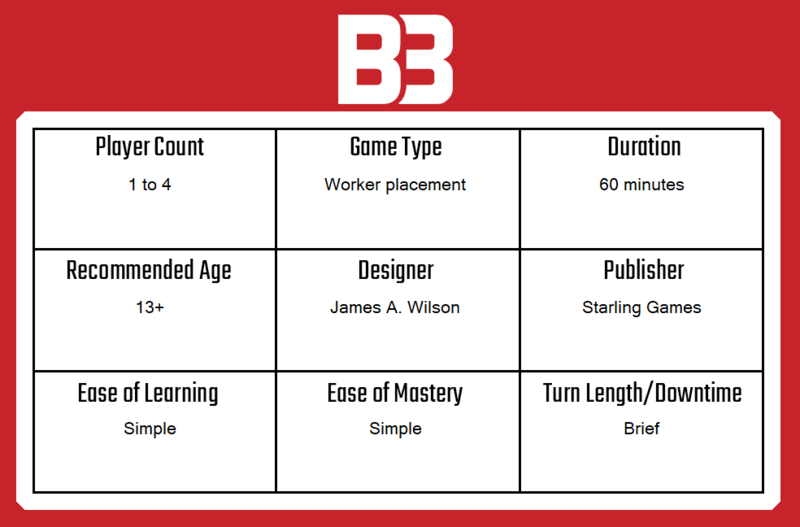 Achieving the right balance of simplicity and depth is never easy and many board games simply don’t try, they unleash their full complexity (for better or worse) onto the player from the outset, which can create an artificial barrier of entry for some players that can’t be overcome. Everdell quite literally does the opposite. It begins with the most basic of worker placement actions and builds into a complex, brain burning mixture of decisions that focus on optimising every single action. The term gateway game is now used so frequently that I’m not sure it has any value. What is a gateway game anyway? Often it simply seems to suggest that a game has to be as straightforward as something like Monopoly, yet I find that a lot of games carrying the label fail to prepare their charges for what modern board games are really capable of. Everdell might be the perfect gateway game based on my new definition. Why, you ask? Simply put, it does almost everything right — it’s beautiful and well made, it’s very simple and easy to teach, yet despite all that, it’s complex enough to develop some very competitive play. If I have one complaint about Everdell, it’s only that the final scoring can be a bit messy with the frequent need to recount when the score is close. And there you have it, I’ve reached my conclusion earlier than I should have, but I truly hold very few reservations about Everdell. I love the look of it, from the squishy berries to the gorgeous card art. Even the slightly over the top Evertree looks fantastic. Given that the creatures here are simply adorable, you might think that Everdell could be a bit saccharine for adult players, but it’s not — it’s an attractive, detailed theme that reminds me of warmth and love and childhood, but it never made me feel condescended to. As such, I can look at Everdell all day and I can’t wait to show my own children when they are older. I’d show them now, except that the other side to Everdell, the side you can only experience (because it’s not really visible on the cards) is how deep the game is. I’ve played it with some of the best board gamers I know and we’ve had games that reached nearly a hundred points between the top players, yet there was only one or two points in it. We once had a game that was so tight, we drew on seventy three. Creating a game that has as many ways to win as Everdell does, but which remains as tight as it does is a real marvel. Everdell is a superb game and a beautiful product. It deserves its recently held placement in the BGG hotness list and I hope it remains a popular choice that continues to impress new and old players alike. If you only buy one game this year, Everdell should be on the shortlist alongside the likes of Lords of Hellas and Lowlands, with only your personal preference to differentiate between those in the running. A copy of Everdell was provided for review purposes. You can find out more about it on the website of publisher Starling Games. Great review. The middle paragraph of the conclusion is especially helpful. Thank you Dan – It’s fantastic to have positive feedback!